According to the Insurance Information Institute (III) dog bite injuries account for over one-third of all homeowners’ insurance liability claims. One large homeowner’s insurance company reportedly paid over $136 million in one year resulting from about 4,500 dog bite injury claims. Read more information on dog bite injury and insurance coverage. Most folks are aware of the natural animosity that exists between Fido the dog and the mail carrier. Fido just wants to protect his turf. The mail carrier just wants to drop off your mail. So what’s the problem? The US Postal Service reported nearly 6,000 mail carriers were bitten and/or attacked by dogs across the US in 2015. The highest number of those instances occurred right here in California. It is also worth noting that the USPS says that mail carriers are not obligated to deliver mail to a residence they deem unsafe due to a dog. In the United States it is children who are consistently bit the most by dogs. About half of our nation’s 4.5 million dog bites per year happen to children. These young victims have sustained a wide variety of injuries. In the video below, hear the heart-breaking story of a little girl as she describes being bitten by a dog. This video is not for the faint of heart. It has been our experience that Pit Bulls, Rottweilers and German Shepherds are the most common culprits. More often than not, these beloved pets are considered to be sweet, and harmless by their owners. Many dog owners find it difficult to believe that their dog would bite someone. The truth is, dogs do bite when they feel threatened, whether that threat is real or perceived. Who’s Responsible When a Dog Bites? The owner of the dog is responsible for its behavior. Follow this link for California dog bite law. Pet dogs are a joy to have when they are properly socialized and trained well. Obedience training is crucial. So is teaching a dog how to get along with a broad range of people. This includes younger people as well as senior citizens. Even with all these areas covered, dogs should never be left alone around a young child. Supervision of dog with a child is a huge key to reducing tragedies. To read more about why dogs should never be left alone with a child, read: Boy Dies After Violent Dog Attack. There is no doubt that we love our dogs. However, common sense and exercising supreme safety towards others should be the guiding force when it comes to our dogs and the general public. When a delivery person, mail carrier, domestic worker, new person or children visit your home and you own a dog, put the dog in a crate or bedroom to protect others. If you don’t properly protect others from your dog it may be construed as negligence. It is crucial to get prompt medical attention for your dog bite. It is equally of urgent importance to contact animal control to determine if the biting dog has been properly vaccinated. Rabies is a serious life-threatening illness that can be contracted through a dog bite. Learn more here: Types of dog bite injuries. Fear of dogs poses a huge challenge for the dog bite victim. Even if the victim was formerly a dog lover prior to the attack, she or he may no longer feel comfortable at all around dogs. 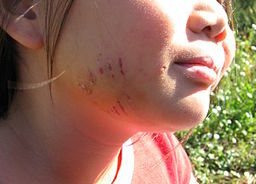 Typically, after a violent encounter, a dog bite victim will feel intense fear and anxiety. It may become difficult for them to enjoy the companionship of a dog after being bitten. For more information, read dog phobia. I’m Ed Smith, a Sacramento Dog Bite Attorney. If you or a family member has been bitten by a dog, the dog’s owner may be liable for your medical treatment and psychological bills. I can help you pursue a claim for your expenses and suffering caused by the attack. As soon as you have been treated by a doctor, please call me right away at 916-921-6400 for fast, free, friendly advice. Time is of the essence. You will probably hear from the dog owner’s insurance adjuster. It is important NOT to give a statement or sign anything. Simply ask the insurance adjuster to speak to your dog bite attorney. We have the experience necessary to negotiate the best possible outcome for you or your family member. Please see Ed Smith reviews on: Yelp, Avvo and Google. Ed Smith is a Member of Million Dollar Advocates Forum. For a proven track record of success see Ed Smith’s past verdicts and settlements.